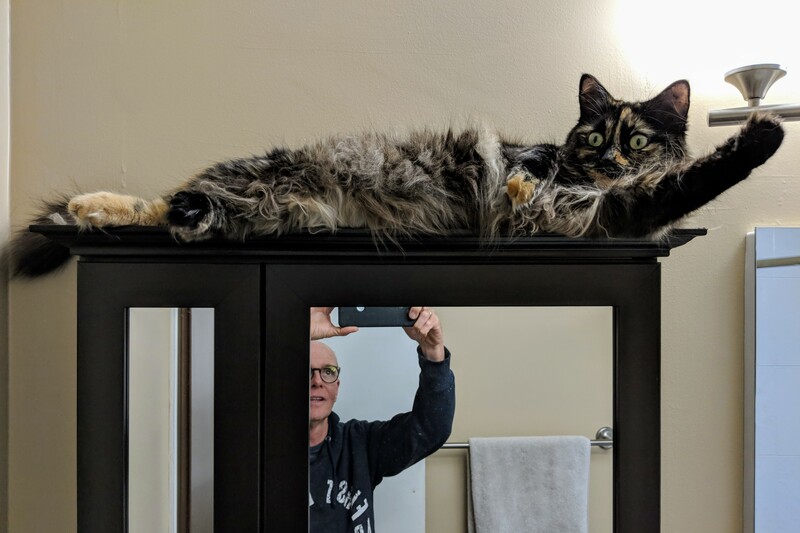 More posting catch up: On Friday Oct. 19, 2018, Cali climbed up on the bathroom medicine cabinet—as she sometimes does. But on this evening, the Tortoiseshell put on a little show that I had to capture. The Featured Image comes from Google Pixel 2 XL. Vitals: f/1.8, ISO 148, 1/125 sec, 4.459mm; 11:02 p.m. PDT. If you’re looking at me in the mirror and wondering…yes, I’ve put on about 10 pounds since my most recent profile photo. Necessary, too, sadly. I had dropped below normal body mass index for my height and age. Interestingly, my weight started creeping up after a prescribed antibiotic (for diagnosed strep throat) changed my gut flora. Eleven months later, and something still isn’t like before. Problem: After celebrating my 14th birthday with an appendectomy, I no longer have an appendix to repopulate my stomach’s natural collection of beneficial bacteria. Since taking the medicine, my lifestyle hasn’t changed, just my gut (hehe, that’s inside and out).